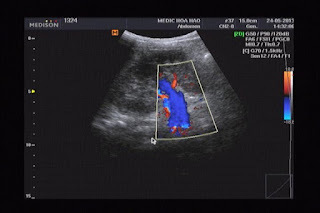 CASE 190:LARGE TRAUMATIC PSEUDOCYST OF PANCREAS IN ADULT: Nguyen Duc Duy Linh, MD - Nguyen Ngoc Xuan Giang, MD – Dr Phan Thanh Hai, Binh An Hospital, Kien Giang, Viet Nam. A 29 year-old male patient complains: for six months bloating of the abdomen, non deep ache, difficulty in eating and digesting food and having a mass of 150x200mm in his epigastric region. He had a trauma of epigastric region by traffic accident seven months ago and had been operated for it. 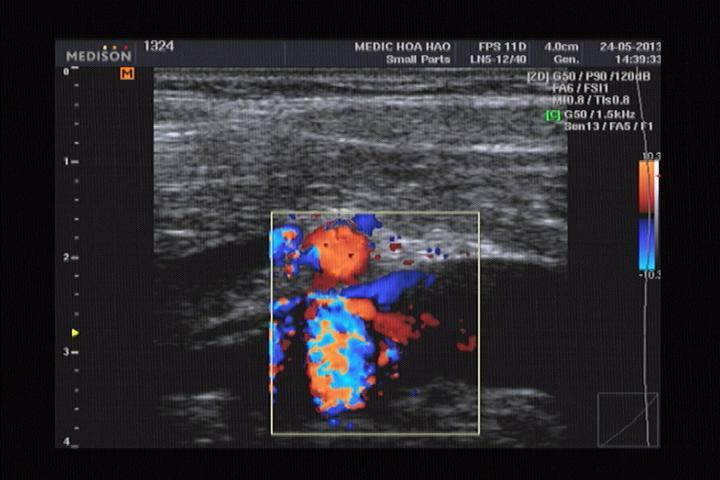 Ultrasound examination : Cross-sectional images of the mass in epigastric region. It was a large anechoic mass with posterior acoustic enhancement, smooth contour, unilocular, no Doppler signal, size of 145x134mm, was thought to be a pseudocyst which had pressed on nearby organs (liver, stomach). It was a pancreatic pseudocyst but having a differential diagnosis of liver cyst. MSCT showed a well-defined unilocular pseudocyst in the pancreatic head and body, thin wall, size of 85x138mm. It was pancreatic pseudocyst, wall thickness of 7mm, filled yellowish fluid. Surgical drainage of the pseudocyst, which involves making a connection between the cyst and the jejunum (Roux-en-Y anastomosis). Pancreatic pseudocyst caused rarely by trauma and frequently happens in children. This case was a large pancreatic pseudocyst in adult due to trauma. 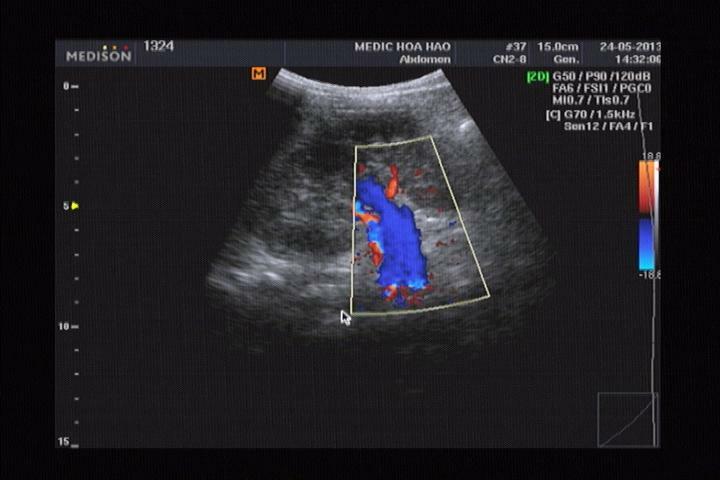 Ultrasound was confused with a liver cyst and priority of was MSCT higher than. In this case, surgery asked for fluid analysis but forgetting of counting amylase enzyme in withdrawn fluid, but we had microscopic report of specimen to confirm a pancreatic pseudocyst. Dapo Popoola, Mary Ann Lou, and Edward H. Sims. Traumatic Pancreatic Pseudocysts .J Natl Med Assoc. 1983 May; 75(5): 515–517. Griffith, Antonio, Wong, Lee Chu, Levine, Ho, Paunipagar. Expertddx ultrasound. Amirsys. 2010. Section 5:2-3. Hassan A El Musharaf, Mohamed A Al Auriefi. 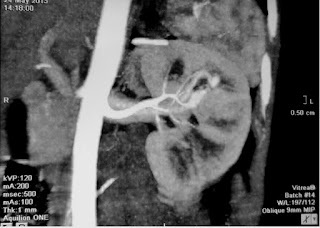 Traumatic pancreatic pseudocyst. The Saudi Lewis G, Krige JE, Bornman PC, Terblanche J. Traumatic pancreatic pseudocysts. Br J Surg. 1993 Jan; 80(1):89-93. Louis R Lambiase, MD, MHA; Chief Editor: Julian Katz, MD. Pancreatic Pseudocysts . http://emedicine.medscape.com. Michael AJ Sawyer, MD; Chief Editor: Eugene C Lin, MD. Pancreatic Pseudocyst Imaging. http://emedicine.medscape.com. Male boy 12 yo had been in operation of cystostomy for removing blood clot 3 months before, but unkwon cause , and now hematuria is recurring. 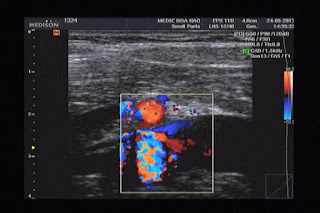 Ultrasound of abdomen detected left renal vein dilated, big and big in comparison to one on right site, color Doppler shows very low flow in left dilated renal vein. (see 3 pictures). 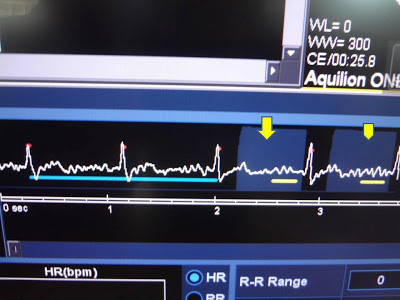 MSCT CE UROLOGY detected left renal vein dilated and pressed between aorta and SMA, and early filling contrast, suspected one A-V SHUNT at upper pole of left kidney. (See 3 images of CT with CE). Planning to do DSA for make sure diagnosis of hematuria and site of bleeding. CASE 188: MEDIC RADIOLOGY CASE 5: THYMOMA and THYMOCARCINOMA, Dr Nguyễn văn Công-Dr Hồ Chí Trung, Medic Medical Center, HCMC, Vietnam. 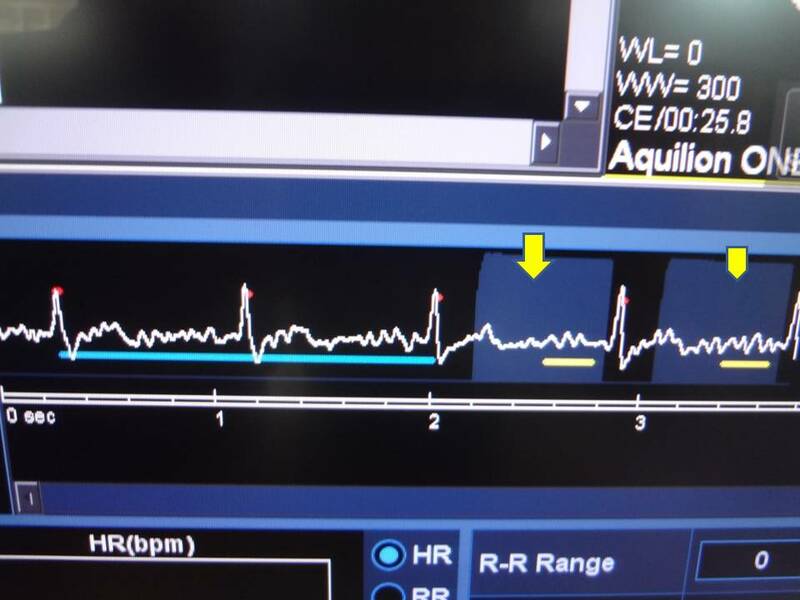 Mr A. and Mr B. are two 64 yo male patients, have a heath check at Medic Center some days apart. On the PA and lateral CXR a round shadow about 3-6 cm of diameter seen on anterior mediastinum R side. On thoracic US examination, 2 encapsulated, with septations mixed structrure of solid and liquid contents on R lower anterior mediastinum of 3-5 cm diameter look alike on both patients. 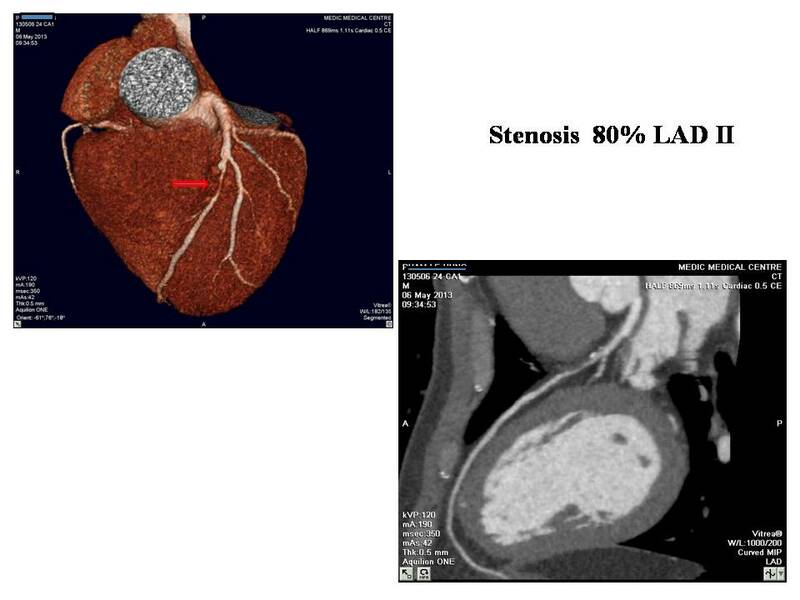 CT scan of both chests show almost the same findings as a mixed components with solid and fluid, septated, encapsulated, contrast enhanced on R lower anterior mediastinum. Imaging diagnosis: Right Anteroinferior Mediastinal Tumor can be thymic origin. Both men go for surgery to remove the anterior mediastinum tumor. The pathology report of Mr A.: THYMOMA TYPE A WITH CYSTIC CHANGE. Mr A. after the surgery is still living and working till now. Mr B. still alive some months after radiation and chemotherapy. 1/ Imaging diagnosis is only the shadow of the truth. 2/ Pathology give us one part of the truth. 3/ Clinical findings, imaging and pathology can give us almost the truth. 4/ But the truth itself is the outcomes of the patients . 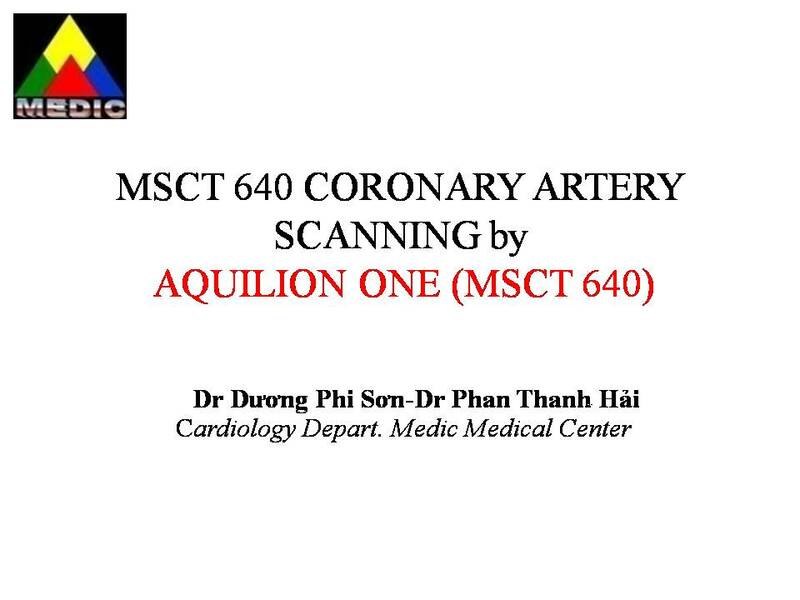 CASE 187: MEDIC RADIOLOGY CASE 04: 170 CORONARY ARTERY CASES SCANNING by MSCT 640, Dr DƯƠNG PHI SƠN-Dr PHAN THANH HẢI, MEDIC MEDICAL CENTER, HCMC, VIETNAM. • 170 cases (79 male / 91 female) in our 2 weeks of setting up the new machine. 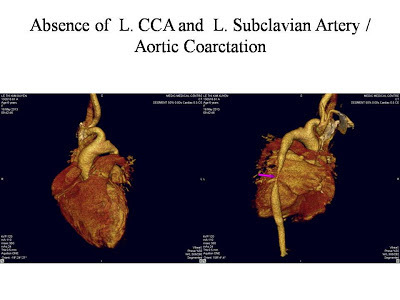 • Angina pectoris and risks of coronary artery disease. • Patients hold their breath during shooting. • Image quality greatly improved (increased levels of accuracy). 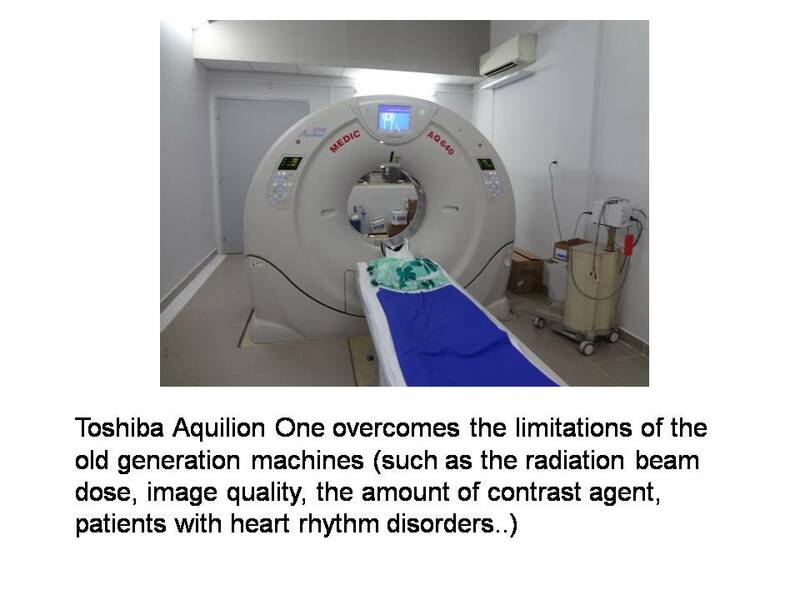 • Radiation dose reducing 50-90% and extremely low amount of contrast agent (competitive and beneficial to the patient). • Cardiac arrhythmia still could be scanning (more advantage than the older generation machines). 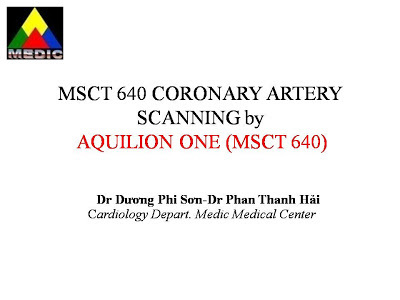 • Shooting and find the cause of the chest pain emergency. Female patient 28yo underwent R hemicolectomy as adenocarcinoma in November 2011 at BD hospital. On 4 April 2013 she came back to BD Hospital to be removed both 2 ovarian tumors (Krukenberg) for metastase from colon tumor. And after surgery of ovarian tumors for 3 weeks, she detects herself her right breast swollen, hard in palpation but without pain so she returned BD hospital again. BD hospital ultrasound showed secondary right breast tumors and she was sent to MEDIC to take a mammography. and some R and L cervical nodes. 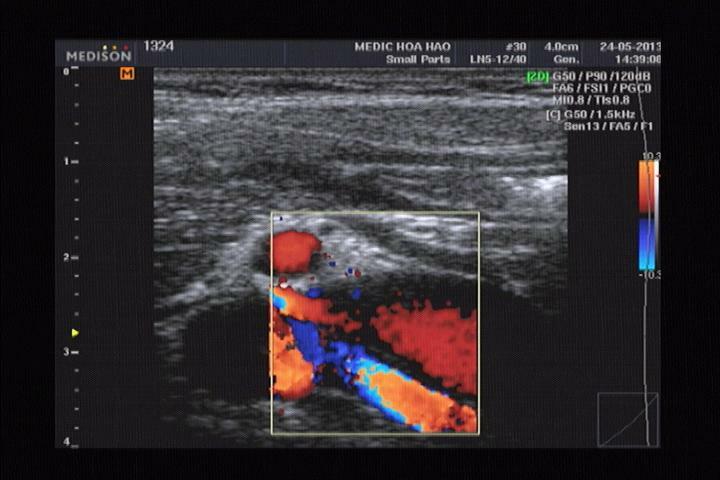 MSCT 640 proved a right breast tumor with ROI=25HU and axillary nodes and R pectoralis muscles nodes. FNAC of right breast tumor was done and microscopic result was adenocarcinoma﻿. In conclusion, a 28yo female patient which were removed R colon tumor and ovarian tumors due to metastase now has a R breast tumor BIRADS 4 and R axillary nodes and R and L cervical lymph nodes. Do you think a case of Lynch syndrome? Is it sure that secondary breast tumors? What to do in the next step ? Surgery was performed on 24/5. So it was a primary breast tumor, both macroscopic and microscopic findings and not a metastatic tumor of the breast from colon tumor and that may belong to Lynch syndrome. Waiting for genetic test to confirm the final diagnosis of Lynch syndrome.